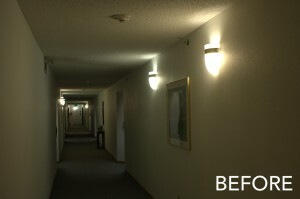 Village Place Apartments is a 72-unit complex and, like most apartment complexes, Village Place’s interior corridor lighting is turned on 24 hours a day, 7 days a week. During the retrofit, 56 lights were updated with the TerraLUX Linear LED Engine including: wall sconces, overhead dome lights, bathroom lights and outdoor lights. 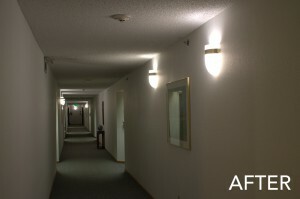 Each hallway wall sconce contained two CFL lamps and an external ballast, averaging 34 watts of power consumption. After being retrofitted with the TerraLUX Linear LED Engine, each wall scone now only requires 11.5 watts for an energy savings of 22.5 watts per light. As a result of the upgrades made, Village Place Apartments is estimating energy savings of over $1,200 annually. Additionally, the TerraLUX LED solutions are providing better quality of light throughout the building with improved lighting color and a 15-year life expectancy. 34 watt sconces using Compact Florescent Lamps. Corridors had inconsistent color and output, and heatspots could be seen on the walls above the fixtures from the ballasts inside the sconces. 11.5 watt sconces using TerraLUX LED Engines. 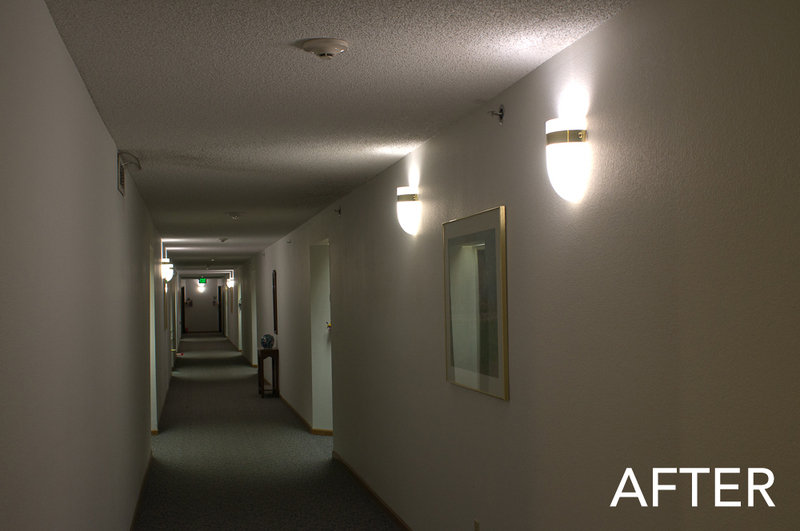 Corridors now have uniform color, improved color accuracy, and energy consumption has been cut by over 50% on the single largest lighting demand – always on hallway lighting. Village Place Apartments were opened in 2005 by Longmont Housing Authority, and provide 72 apartments for seniors 62 years of age and older, disabled, and subject to income restrictions. In 2007, a $1 million renovation project was completed, upgrading the 15-year-old building. The renovations included upgrades to major building systems such as boilers, roofing, common areas, exterior siding and appliances. Additionally, energy efficiency measures were taken, upgrading room lighting systems, installing boiler pre-heat solar system on the roof and more.